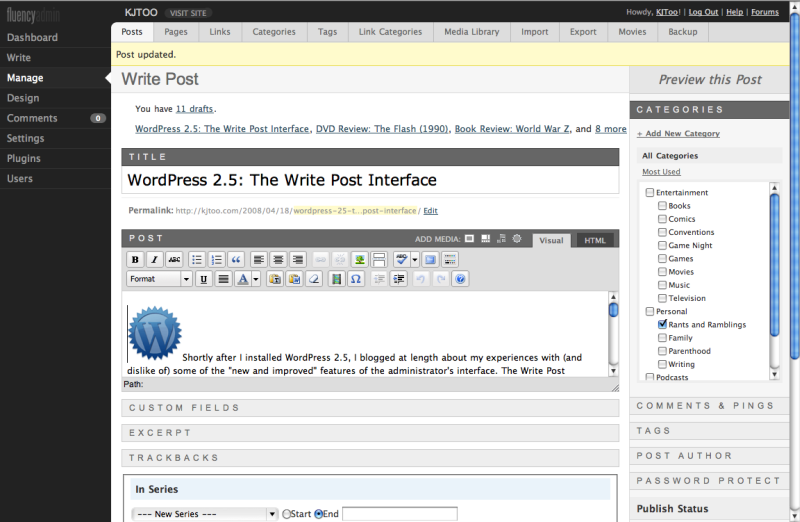 WordPress 2.5: The Write Post Interface | Kris Johnson's Blog…sort of. Point taken. 😉 I’ll go knit a pair of socks or something. Judy – By all means, keep hacking. I’ve got plenty of socks, but without your hack I’d probably be tearing my hair out right now. Pete – You’re welcome. I’m not sure what my “kind” is, but I’m sure we’re doing pretty well. Rob — Let’s not go writing any eulogies for The Funny just yet; it’ll be back. The WordPress stuff may not invoke a chuckle, but it does open a dialog. We need to get our 2.5 experiences more widely known. No-one reads my blog, and when I’ve posted on high profile like sites, like Zeldman, there has been no response. Any ideas? Matthew — I wish I had an answer. I’ve only got a handful of readers, myself, though several of them do use WordPress. In some cases, they’ve been shying away from the upgrade based (partly) on my experience, but that’s not going to be a viable solution for very long. Sooner or later, someone is going to identify a security hole in WP 2.3.3 and the upgrade will become a necessity (and if the developers are turning a deaf ear to concerns over the new admin interface, the likelihood of them providing a security patch for the old and outdated 2.3.3 is pretty slim). Will we see more of an outcry once those folks (and folks like them) are forced to upgrade? Possibly, but will that renewed clamor have any effect on the developers? Doesn’t seem like it. Apart from posting on the official feedback forums (which, as it turns out, is apparently an exercise in futility), submitting trac/idea requests (ditto), ranting about it in my podcast and blogging about it here, I’m out of ideas. That was all he said, he didn’t respond to my comments about the Feedback forum being ignored. Matthew — I wish I could be surprised by Mullenweg’s response, but I’m not. I think the developers have chosen their path and they’re going to follow it, leaving hackers, modders and plugin/theme authors to clean up the mess. Of course, if they want to prove me wrong, I’ll be more than happy to eat that particular crow. He admits they are going to be looking at the Categories problem (and by extension, one assumes the Write screen problems in general). Sounds great? Yes and no. If HappyCog couldn’t get this right before the software was released and Matt now says they’ll try again, it rather suggests the whole thing was ill conceived in the first place, which further suggests the ‘user analysis’ they conducted suffered from a major flaw: they aren’t working with a representative user set. This is all gate-horse-bolted stuff, but might interest you nevertheless. Matthew — I don’t know whether or not the way I use WordPress is representative of the user base at large, but I’ve discussed this with enough people in and outside my circle of friends that I’m beginning to feel like I blog the way most people do. The Happy Cog slideshow seems to (at times) advocate an attitude that is entirely the opposite of what Happy Cog did with the Write Post interface, namely the whole idea of not noticing the interface because it works so well (which is certainly not the case with the new Write Post interface) and the revelation that users don’t like surprises. As for the discussion on Google Groups, I applaud Otto and Stefano for recognizing the overuse of whitespace and poor arrangement of elements, but the “it is what it is” attitude that follows their comments isn’t terribly promising. Yep, there’s some deeply ironic commentary to be made about HappyCog here but I’m kinda past caring now. Wondering if you might share your .js/.css changes that you made to get Judy’s hack to work with Fluency? Matthew — I was going to post my tweaks to Judy’s hack, but you nailed it! I can’t tell you how long it took me to track down how the disclosure triangles worked so I could comment out that one line in postbox.js. Well done. Matthew — Zeldman doesn’t seem to have approved your comment yet (assuming you posted it after I posted mine); I’ll check back a bit later. I did noticed that the sidebar overlaps into the footer when my Categories are expanded, which is why I hesitated to publish the hack tweaks. Like you, though, I can live with it; function before form, right? I’m impressed with your tenacity on the whole issue. You’re like a pit bull! You wouldn’t say that if you met me; maybe more like a poodle when viewed side on. 😉 Seriously though, I don’t like not getting answers: that’s the only reason I keep pushing it. 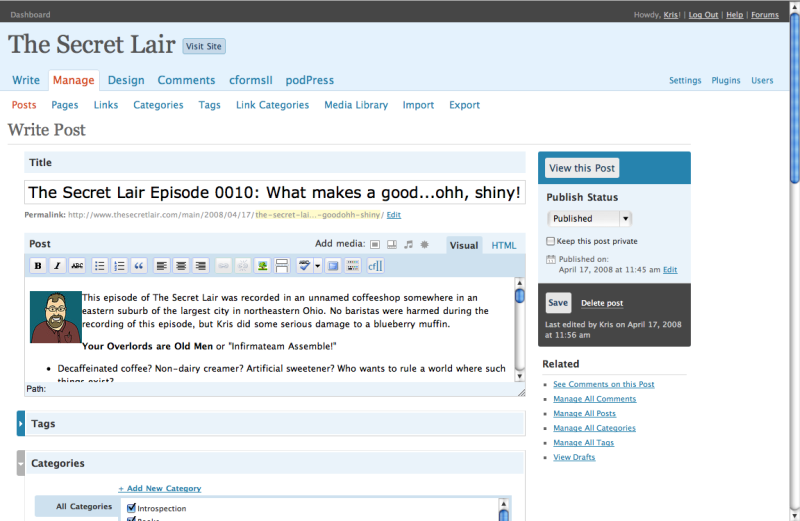 I’m already testing out Expression Engine, Drupal and Symphony, ready to move to something better. Sadly I need to stick with WP for some ‘in production’ stuff as it’s gone too far to switch now. Matthew — I mentioned Symphony to Chris “Codeshaman” Miller and he said he didn’t care for it. We didn’t go into a lot of details; I was just moaning about my installation issues (that’s what I get for installing to my hosted site instead of building a LAMP server at home for testing). I do have an installation of Expression Engine running on my site, just to play around. I need to dig into the documentation and see what I can do. I can’t get my head around Drupal — it has a very odd way of doing things! I’m one of those people who doesn’t like ‘live’ admin areas being combined with the site so this really confounds me — and I have no idea how to build a nested menu system despite having gone through several tutorials. It’s pretty arcane. Haven’t yet had time to look at the others. Ironically, while this discourse is about responsiveness, I’m still waiting for Matt to reply to my email about the problems with the feedback forum. Somehow I doubt he will. Matthew — Thanks for another great link. I’ve added my two cents on Andrew Boyd’s blog as well and now I wait for the sun to rise on the other side of the planet so my comment can be approved. I can’t claim to know the first thing about Drupal, myself. I managed pretty well in WordPress, but too much exposure to a full-fledged Content Management System and I start bleeding out of the eyes. Have either of you posted your mods to my hack over on the WordPress forum? I stopped using Fluency after I’d hacked the write page into submission, but I know a lot of people still use it. Thanks for the link to Andrew’s blog as well. I’d like to see if Matt ever does follow up on moderator callousness. Judy — I’ll compile the changes we’ve made to your hack (I’ve tweaked the CSS a bit more) and post them on the Support Forum sometime tonight. Matthew — I reiterate my pit bull simile. I, on the other hand, am a slacker, as I’ve not yet posted the tweaks to Judy’s hack on the support forums. – remove ‘Title’ label to save additional 30px of vertical space that brings the ‘Categories’ and ‘Tabs’ selection up even more. 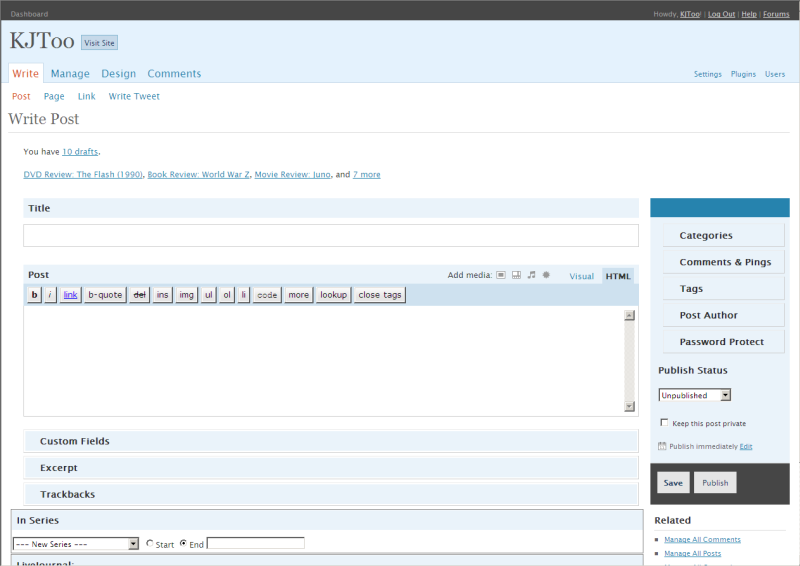 – place the main navigation bar right next to the blog’s title. These are the only small modifications that I personally needed to find the new admin panel superior to the previous one. Kaspars — Thanks for the link. Baltic Amber is indeed a nice plugin. I looked at it when it was was featured on Weblog Tools Collection, but by that time I was already using Fluency with Judy’s hacks. I installed Baltic Amber on one of my other blogs last night and it does look nice, but I do still prefer the Categories and Tags in the sidebar. I just added this to one of my blogs, and the wp-admin/css/global.css file is only 198 lines long, and doesn’t have the lines that you mentioned you edited, yet it’s working just fine. Ideas? Hi Adam — sorry, that’s a mistake, it should be the wp-admin/wp-admin.css for those margin tweaks, and they only apply if you’re using the Fluency admin theme as well as Judy’s hack, unless she fixed it in her 2.5.1 update. My tweaks were for implementing the hack in 2.5.